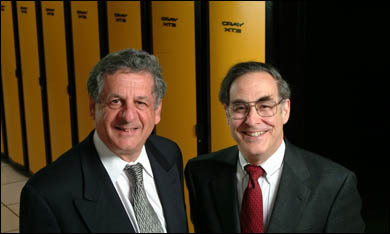 Pittsburgh Supercomputing Co-Directors Michael Levine (right) and Ralph Roskies stand in front of the PSC's newest, most advanced system: the 10-teraflop Cray XT3 known as "Big Ben." More than one innovator in the computer industry can trace their beginnings to the confines of a humble garage: Apple computer magnate Steve Jobs, and his former partner Steve Wozniack; Hewlett-Packard founders, Bill Hewlitt and Dave Packard. In Pittsburgh, this "Why can't I?" attitude — characteristic of innovators regardless of circumstance — was shared by high-energy physicists Michael Levine and Ralph Roskies 20 years ago. But over lunch—not the trappings of a dusty garage. The story goes like this: Carnegie Mellon physics professor Michael Levine proposed that he and his research colleague, University of Pittsburgh physics professor Ralph Roskies, submit a proposal in response to a National Science Foundation (NSF) solicitation to fund supercomputing centers. Roskies was skeptical. "Why would they give a supercomputer to us?" he asked. "Who else should they give it to?" argued Levine. This way of stating the case turned Roskies thinking around, and with help from Westinghouse, a partnership that continues today, the Pittsburgh Supercomputing Center (PSC) was launched in 1986. With large thanks to Levine and Roskies' "Why not us?" attitude, PSC celebrated its 20th anniversary Friday, June 16. "The celebration was significant because we're still here and the center is still needed 20 years later," says Beverly Clayton, who's been executive director at the PSC since the beginning. "We've made our facilities available for private and government use and we see that the nation's researchers are insatiable in developing models that require the use of supercomputers. Now as much as ever." As part of the gala, there were several research demonstrations, including some from the PSC's newest, most advanced system: the 10-teraflop Cray XT3 known as "Big Ben." This purring Porsche of computers — capable of 10 trillion calculations per second — boasts as much processing capacity as 30,000 PCs. The event included brief remarks from Pennsylvania Governor Edward Rendell and other dignitaries including Kathie Olsen, deputy director of the National Science Foundation, Carnegie Mellon President Jared Cohon, University of Pittsburgh Chancellor Mark Nordenberg, James Kasdorf, director of Special Projects at the PSC and former director of supercomputing at Westinghouse Electric Corporation, and Aris Candis, senior vice president of Nuclear Services for Westinghouse. President Cohon said the center is "an enormous success that brings a great deal of pride to Carnegie Mellon and the University of Pittsburgh. What the Pittsburgh Supercomputing Center does is important for our nation and our region." Governor Rendell echoed this comment by stating how the PSC helps to ensure the U.S. remains globally competitive in high-tech fields. A growing demand among scientists in the early 1980s was the impetus for the PSC's NSF grant. Researchers clamored for greater computing power to handle non-military research. Until this time, supercomputers had been reserved for classified projects at sites like Los Alamos, location of the Manhattan Project in the 1940s. With greater access to computing power, scientists who have used the PSC's facilities over the last 20 years have made terrific advances in modeling of earthquake soil vibration in unprecedented detail, forecasting of severe thunderstorms and creating a lighter-weight, more durable aluminum used in pop cans. Other highlights include pioneering air-pollution studies for the Los Angeles air basin that influenced federal legislation, the first three-dimensional model of blood-flow in the heart, an accurate forecast of Comet Shoemaker-Levy 9's impact with Jupiter, and protein modeling that contributed to the 2003 Nobel Prize in Chemistry. Clayton says the PSC has built a strong national presence in biomedical research. When established in 1987, their NIH-funded biomedical supercomputing program was the first such program in the country external to NIH. "It's safe to say we've played a large role in the growth in biomedical computing," Clayton says. One breakthrough in this field, through work at the PSC, was the improved design of an artificial heart valve. To justify the use of a supercomputer, scientific projects must be complex yet tangible enough that a researcher can devise a functional model. Proposals are submitted to an NSF peer review board. Since the PSC was founded, supercomputing has evolved considerably. The now extinct ancestor of Big Ben, the Cray X-MP, was cutting edge in April 1986. In contrast, this supercomputing power of 20 years ago is equivalent to what an advanced PC can do today, and Big Ben is 10,000 times as powerful. As a further sign of the PSC's prominent place in U.S. computational science, as of two years ago, it became one of the lead partners in the TeraGrid, the NSF cyberinfrastructure program that envisions computational resources linked together across the country and integrated to provide scientists with computational power in ways analogous to how electrical power grids supply our homes with electricity. Last year, the PSC received a $52 million grant from NSF to support its operations as part of the TeraGrid. Much can happen when two high-energy phyicists ask, "Why not us?" For more on the PSC, visit http://www.psc.edu/.